Dempsey Dyer manufactures high quality PVCu windows using Deceuninck's 2500 Chamfered, 2800 Decorative and 3000 Zendow profiles suites - allowing us to completely satisfy your project requirements. Our full range of u-PVC windows are available in a variety of colours and foiled/woodgrain effects to suit any specification. Choose from our standard range of finishes or Deceunink's 'Deuctone' range of bespoke finishes. Dempsey Dyer also offers five different bead options: Standard, contemporary, decorative, chamfered and the 2800 series decorative. Availablity is dependable on type of profile. Our uPVC casement window can be manufactured using the full range of Deceuninck profile suites and is Secured By Design accredited for consumer peace of mind. Dempsey Dyer pvcu pivot windows are fabricated using the Deceuninck 3000 Zendow profile. Aimed at the high rise market, our pivot windows are ideal for schools, hospitals, offices, hotels, residential homes and sheltered housing. 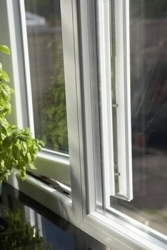 We manufacture PVC-u tilt and turn windows using the full range of Decueninck suites. The unique design of the tilt and turn window allows for maximum light to be achieved on larger structural openings.